To Cite: Hajiabdolbaghi M, Esmailpour N, Rasoolinejad M, Hedayat Yaghoobi M, Dehghan Manshadi S A. Disseminated Tuberculosis Imitating Systemic Lupus Erythematosus, Arch Clin Infect Dis. 2013 ; 8(3):e17288. doi: 10.5812/archcid.17288. Introduction: Mycobacterium tuberculosis (MTB) is one of the most common causes of disseminated granulomatous diseases especially in developing countries. Case Presentation: We present a patient who had an unusual type of tuberculosis who was misdiagnosed with some other common diseases such as infective endocarditis and collagen vascular diseases. Pathological examination helped us to make decision. Discussion: MTB can present with protean clinical manifestations and cause various laboratory abnormalities. In endemic areas, vigilance is essential to control this infection. Mycobacterium tuberculosis (MTB) is one of the most common causes of disseminated granulomatous diseases especially in developing countries. Disseminated tuberculosis must be considered in differential diagnosis of a vast range of clinical presentations (1). It accounts for nearly 1 - 3% of all tuberculosis cases (2). 1.8% of tuberculosis cases reported in 2006 in the United States were disseminated tuberculosis (3, 4). Although fever, weight loss and hematologic abnormalities are common presentations of this infection, it may cause unusual medical problems. Severe immune hemolytic anemia (5), lymphoma-like manifestation with generalized lymphadenopathy and hepatosplenomegaly (6), dactylitis in a patient with immune suppression (7) and prostatic involvement (8) have been reported in disseminated tuberculosis. TB and systemic lupus erythematosus (SLE) have similar manifestations, such as fever, myalgia, arthralgia/arthritis, rash and multi-organ involvement (9). In this study, we report a case of disseminated tuberculosis with prolonged fever and SLE criteria. A 60-year-old woman was admitted to our hospital with complaint of prolonged fever and chills. She had history of undergoing coronary artery bypass grafting (CABG) and heart valvular replacement because of mitral valve stenosis. Three months after surgery, the patient had experienced intermittent fever, chills and sweating. After an initial outpatient evaluation, since there was no cause for fever, patient had been admitted to another hospital approximately three months before being admitted to the other center. During that period, patient had been treated for probable infective endocarditis with vancomycin, rifampin and gentamicin. During the treatment, thrombocytopenia had been observed in laboratory tests, and physicians had thought that this problem was induced by rifampin. After exclusion of endocarditis by echocardiography, antibiotics had been discontinued and the patient had been referred to another medical center for further investigations. After discharge, her fever and chills had attenuated and the patient did not follow up. After about two months, she admitted again because of exacerbation of previous clinical symptoms and underwent further evaluations. In the next subsequent investigations, the positive tests for fluorescent antinuclear antibody (FANA) (FANA: 1/40), and anti ds- DNA (36, with normal range of up to 20 IU/L) and elevated angiotensin converting enzyme (ACE) (137, with normal range of 8-52 IU/L) along with leukopenia and thrombocytopenia were detected. With some diagnostic criteria for SLE (leukopenia and thrombocytopenia, positive ANA and anti ds-DNA), patient was treated with prednisone, hydroxychloroquine and azathioprine. Despite two weeks of treatment with these drugs, fever was persistent and hematologic problems did not improve. 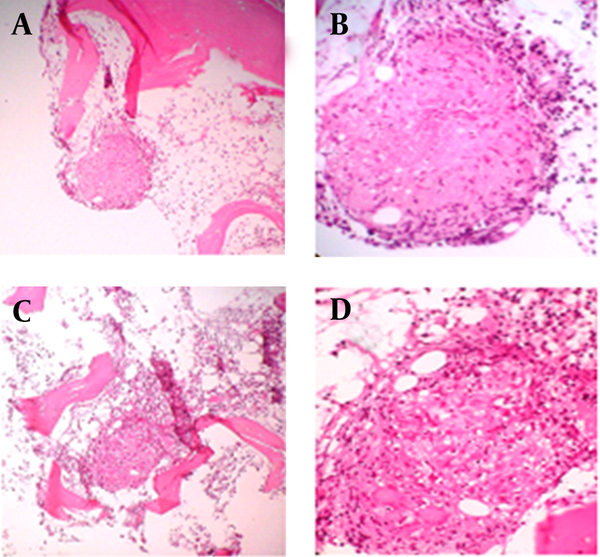 A bone marrow aspiration and biopsy was taken and tuberculosis granulomas were seen in pathological examinations (Figure 1). A) Tuberculoid granuloma; B) Tuberculoid granuloma with remarkable central zone of necrosis; C, D) Another granuloma with two distinct multi-nucleated Langhans' giant cells. According to these findings, the patient was referred to infectious diseases ward for decision making about the possibility of infection with MTB. On examination, the patient had good cooperation; she had oral temperature of 39°C and tachycardia. There were no other significant points on examination. Laboratory studies again revealed leukopenia (WBC: 2500/μL) and thrombocytopenia (Plt: 20,000/µL). Tuberculin skin test (TST) was 22 mm. There was no evidence of pulmonary involvement in radiological examinations. Slides of bone marrow biopsy were reviewed. Bone marrow specimen was evaluated again for acid-fast bacilli and the result was negative. According to our evaluation, especially the bone marrow pathology, hydroxychloroquine, azathioprine and corticosteroid were discontinued and treatment with anti-tuberculosis drugs including isoniazid, rifampin, pyrazinamide and ethambutol began. After two weeks of treatment, fever and chills were disappeared. She had also good appetite and platelet and white blood cell counts rose up to normal range (WBC: 4900, Plt: 104000). Patient was discharged with anti-tuberculosis drugs and hematologic abnormalities were completely resolved in outpatient follow-up. The incidence of disseminated tuberculosis increases with age. In a study in Iran, it was shown that this infection is more prevalent among the 60 - 69 year-old population (10). In another study in the United States, the mean age of the patients was 52 (11). SLE and TB are closely related to the host immunity (12).There are several conditions that predispose patients to disseminated tuberculosis including human immune deficiency virus infection, diabetes mellitus, immunosuppressive therapy, hematologic disorders, chronic renal failure, pregnancy and collagen vascular diseases. However, like this presented case, a considerable number of patients may have no apparent immune dysfunction. In one study, 17% of patients with disseminated tuberculosis had no obvious immunity disorders (11). Because there is no specific presentation, a delay between onset of the disease and diagnosis is always available. In our presented case, this lag phase took about three months. By an increase in awareness among clinicians such delays can be avoided (11). There was no abnormality on chest imaging of this patient. Normal chest X-ray may be seen in large number of patients with disseminated tuberculosis. In one study, 13% of disseminated tuberculosis patients had normal chest X-ray presentation (11). Several studies have evaluated the association between angiotensin-converting enzyme (ACE) serum level and tuberculosis. ACE is an exopeptidase that converts angiotensin I to the angiotensin II pressor and most of this conversion takes place in pulmonary vascular bed (13). Alterations in angiotensin conversion can be observed in some pulmonary and granulomatous diseases (13, 14). As detected in our patient, serum level of ACE is elevated in disseminated granulomatous diseases such as sarcoidosis and tuberculosis (15). Excessive secretion of ACE by cells of the macrophage-macrocytic system within granulomas is responsible for increased level of ACE (15, 16). Presented patient had bicytopenia that recovered gradually after initiation of anti-tuberculosis therapy. Hematologic manifestations of disseminated tuberculosis are common and quite variable. Different types of anemia, pancytopenia, leukoerythroblastic anemia, leukemoid reaction and rarely disseminated intravascular coagulation (DIC) may observe (17, 18). Immune thrombocytopenia and hemophagocytic syndrome have been also reported (17, 19, 20). Hematologic abnormalities can predict poor prognosis in these patients (10). An interesting finding in presented case was the detection of some autoantibodies. Mycobacterial infections are known to induce development of autoantibodies and a few of these are also diagnostic markers for other diseases (21). One possible mechanism is that after interaction of neutrophils and phenol glycolipids of the cell wall of MTB, lysosomal enzymes release and autoantibodies against granular components of neutrophils can develop (22). Up to 40% of cases with TB have rheumatoid factors (RFs) in their sera (9). Pradhan et al. reported ANA, ANCA and anti-histone antibody (AHA) positivity in 30%, 24.3% and 21.4% of patients with tuberculosis, respectively (21). Elkayam et al. reported increased levels of different auto-antibodies including anti-ds DNA, anti-sm, anti-RNP, anti-RO and anti-cardiolipin antibodies in tuberculosis (9). The clinical importance of these findings has not been fully understood and needs further investigations. In countries with high incidence of tuberculosis, it is firstly considered in differential diagnosis of granulomatous diseases (23). In patients with a clinical illness and constitutional symptoms with no other causes and positive TST, biopsy specimens revealing caseating granuloma with or without acid fast bacilli on histopathological study strongly suggest diagnosis of disseminated tuberculosis in endemic areas (8). It is notable that acid fast bacilli are detected in bone marrow smear of only a few numbers of patients (11). Tuberculosis is a complex disease, which may present with a variety of symptoms, sometimes imitating auto-immune diseases. The autoantibody profile of TB patients does not help to different this infection from auto-immune disorders (9). As a result, physicians should consider disseminated tuberculosis in differential diagnosis of patients with nonspecific clinical manifestations, including positive antibodies and hematologic abnormalities. We thank Dr. Jafar Taghizadeh Fazli for his consultation about the pathological findings. Implication for health policy/practice/research/medical education: In endemic areas, physicians should consider disseminated tuberculosis in differential diagnosis of patients with nonspecific clinical manifestations, including prolonged fever and hematologic abnormalities. Authors’ Contribution: Dr. Negin Esmailpour and Dr. Seyed Ali Dehghan Manshadi wrote the manuscript. Dr. Mojtaba Hedayat Yaghoobi was responsible for acquisition of data. Dr. Mahboubeh Hajiabdolbaghi and Dr. Mehrnaz Rasoolinejad were responsible for the study concept and revision of the manuscript. Financial Disclosure: There was no conflict of interest to declare. Funding/Support: There was no funding or support for this study.